NAIROBI, Jul 18 2012 (IPS) - The United Nations has called for sustained aid efforts in Somalia to prevent the war-torn country from experiencing another humanitarian crisis as more than three million people remain in need of urgent aid. The U.N. said on Tuesday Jul. 17 in Nairobi that while the situation in the Horn of Africa nation had greatly improved over the last few months, millions remain threatened by acute food shortages and a lack of basic necessities. This, the U.N. said, was compounded by insecurity and insufficient rains. It warned that if aid agencies do not step in to stem the escalating situation, a humanitarian catastrophe could develop. “While famine conditions are no longer present, we need to make no mistake – the absence of famine does not mean that people are not in crisis. Today, 2.51 million people are still in urgent need of aid and a further 1.29 million could slide back into crisis without sustained assistance,” said Mark Bowden, the U.N. humanitarian coordinator for Somalia. Bowden, who spoke ahead of an official launch of a revised consolidated appeal for 1.16 billion dollars by global aid agencies on Thursday Jul. 19, said that aid efforts have to be sustained in order to consolidate the gains made in Somalia. According to the U.N., within 90 days of last year’s famine declaration on Jul. 20, the number of people receiving food aid more than tripled to 2.6 million, while hundreds of thousands of acutely malnourished children received nutrition supplements. “Mass vaccination campaigns reduced cases of measles by almost 50 percent. By November, 500,000 people in the affected parts of Bay, Bakool and Lower Shabelle were lifted out of famine conditions. The situation continued to improve, largely due to the effective delivery of aid under extremely difficult circumstances and helped by an exceptional harvest at the beginning of the year,” Bowden said. “We need to finish the job that we started when we announced the famine last year and act now to consolidate the gains and break the cycle of repeated crises that continues to exist. To do this, we must restore people’s lives and livelihoods,” he said. Bowden said that half the sum had been raised, but the remaining 576 million dollars was needed to address the requirements of 3.8 million Somalis until the end of the year. “Humanitarians need these funds to provide urgent assistance for the most vulnerable, while building up Somalis’ ability to cope with future drought and other shocks,” he said. Friday Jul. 20 will mark a year since famine, which claimed tens of thousands of Somalis, was declared in the war-torn nation. The drought had been prevalent in entire Horn of Africa and was described as the worst in 60 years. It was compounded by high food prices and instability in the region. According to the Kenyan Permanent Secretary in the Ministry of Agriculture Dr. Romano Kiome, the food situation in the Horn of Africa remains precarious and has been made worse by poor harvests and low rainfall. “Even in most parts of Kenya, the situation is similarly unfavourable as a result of the poor rains. The government has been forced to go back to the drawing board and strategise on how we will distribute food. We have a considerable number of regions where there are widening shortages,” Kiome told IPS. Kiome said the worsening food situation in Somalia was compounded by the ongoing conflict in the country. “Security in Somalia is still a major concern and we second the U.N.’s call for the need to sustain large-scale humanitarian activities across the country,” he said. Kenya, backed by African Union forces, is engaged in fighting the Somali militant Al-Shabaab in the country that has been afflicted by conflict for more than 20 years. 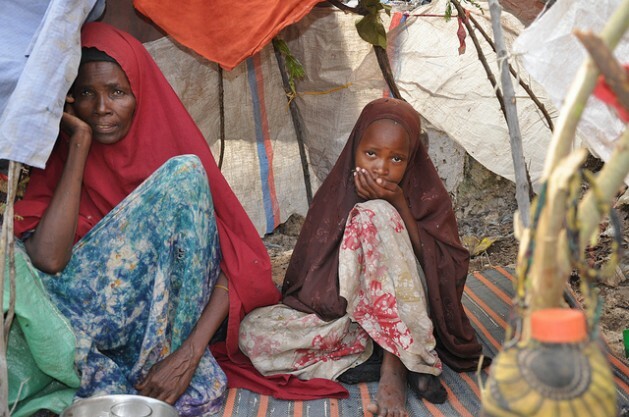 Most Somalis are still living in refugee camps and remain dependent on food aid from agencies. Many are yet to return to their villages, opting to remain in camps where there is a supply of medical and food aid. Statistics released separately by the U.N. Refugee Agency on Jul. 17 showed that more than a million Somalis fled their homeland to neighbouring countries during the famine. Bowden warned that in parts of Somalia, the food situation would deteriorate before it improved as a result of the poor rains from April to June, which were not only delayed but also unevenly distributed. “We do not expect the south of Somalia to deteriorate into famine in the coming months. But that should not in any way lessen the urgency with which we act,” he added. Bowden noted that by providing Somalis with sustainable livelihoods, aid agencies could prevent future droughts from developing into a humanitarian emergency. “We need to help 2.51 million people to obtain life’s basic necessities, such as clean water, sanitation facilities and medical care. We need to help build sustainable livelihoods for people who have been left with few or no resources after years of drought and conflict,” he said.